With free WiFi throughout the entire hotel, accomplishing your goals will be easier. 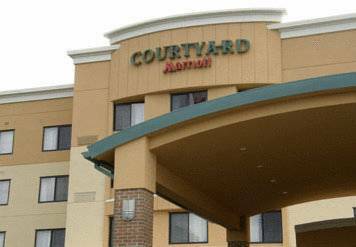 Whether here on business to work with Husky, Procter and Gamble, Ford Motor or St. Rita's Medical Center or here to visit one of the many universities such as OSU/Rhodes, UNOH, Ohio Northern, the Courtyard Lima hotel is the perfect place for corporate or leisure travel. Our contemporary lobby offers you a variety of choices, whether gathering with family and friends or dining with business associates. Need a place to meet? We can handle groups up to 80! We have a state of the art fitness center that can help burn calories while keeping you in touch with the days events or you can enjoy our heated indoor pool to work out the kinks. The world famous Marriott beds are the perfect place to relax and watch our 32" flat panel televisions, now equipped with over 60 high definition channels. Whatever your needs...we can help.